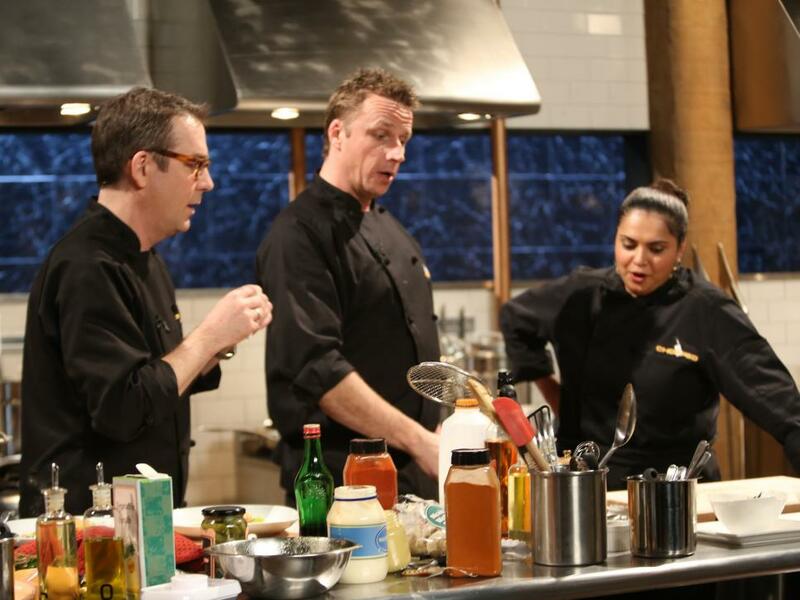 Host Ted Allen and judges Marc Murphy and Maneet Chauhan take on the entree basket from a Chopped episode. 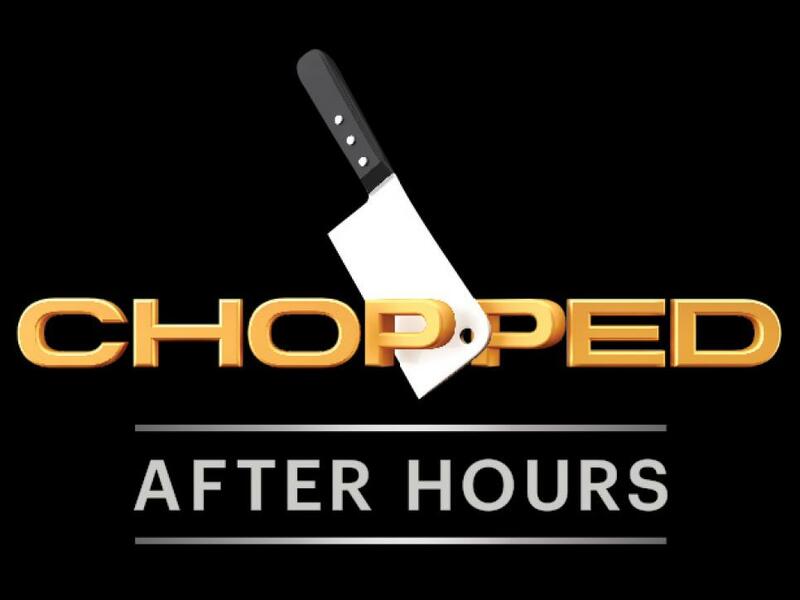 Episode: Break a Crab Leg! 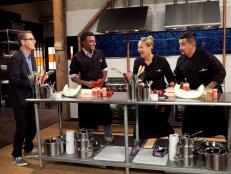 For the first time, Ted enters the kitchen as a competitor, battling Marc and Maneet while Chris fills in as host. 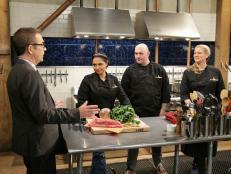 After having watched three chefs cook with crab legs, sweet vermouth, green asparagus and Mexican wedding cookies, Ted and the judges attempt to make an entree with the same ingredients in 30 minutes. Putting an Italian twist on the basket ingredient, Marc prepares ricotta gnudi — two-bite dumplings — in a broth with asparagus. 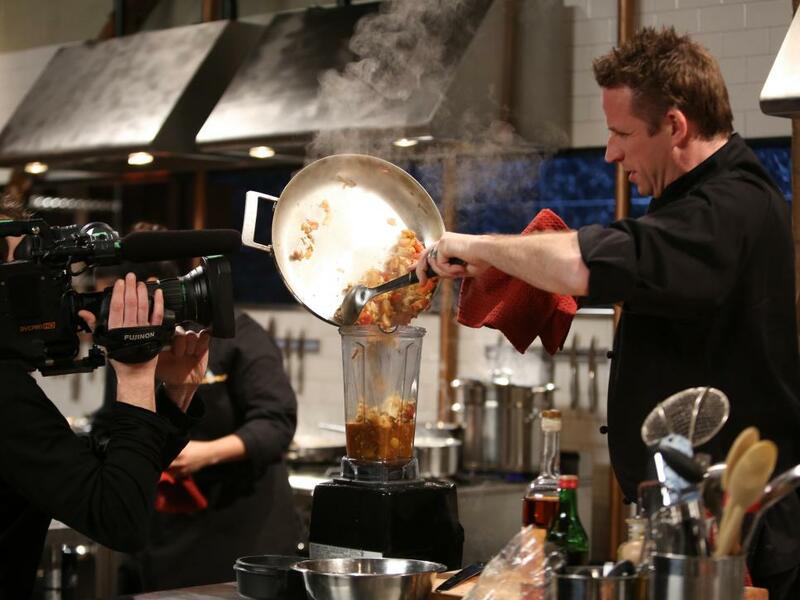 While some chefs are meticulous in the kitchen, Marc is proving to be a messy competitor, accidently flinging chopped crab all over and around his prep station. 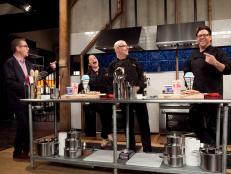 "The good thing about cooking at Chopped is you don't have to clean up," he jokes. 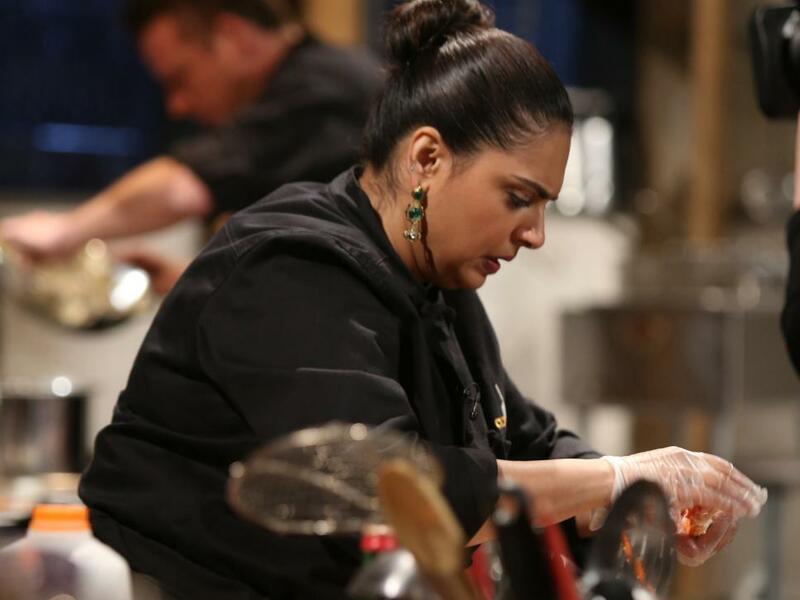 Maneet sets off to make a version of a pot pie, but instead of using traditional chicken, she opts for crab, and given the time constraint and basket ingredients, she's opting for a Mexican wedding cookie topping instead of pastry crust. Ted wastes no time in putting his crab legs in boiling water, as he notes, "The crab is cooked, but it's frozen!" He'll let these tender beauties shine in crab cakes, "Ted-style," with mayonnaise. 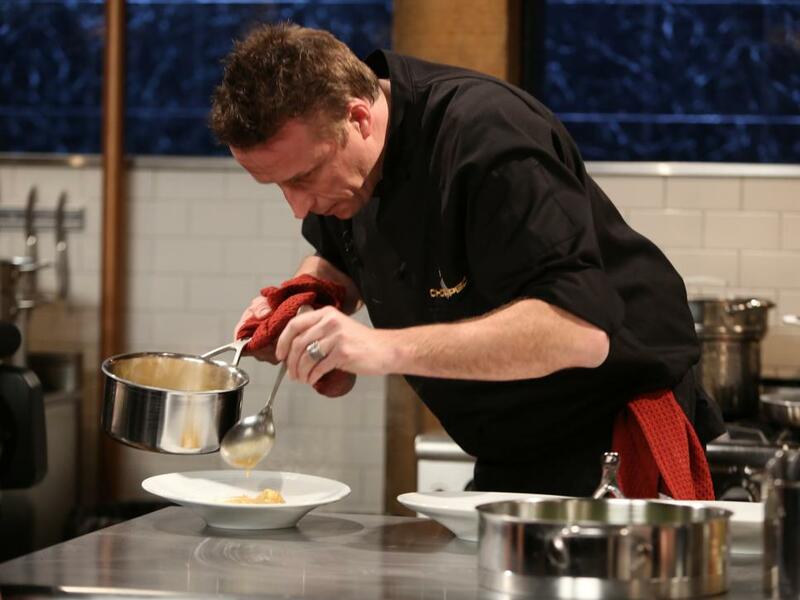 Finishing his dish with minutes to spare, Marc isn't shy about preparing a plate for himself. 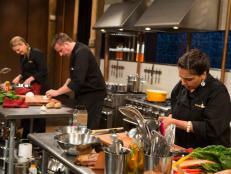 He grabs a glass of wine and takes a seat at the judges' table to enjoy a few bites while Ted and Maneet finish cooking. "The balance, the flavors — it's delicious," he says of his own plate. 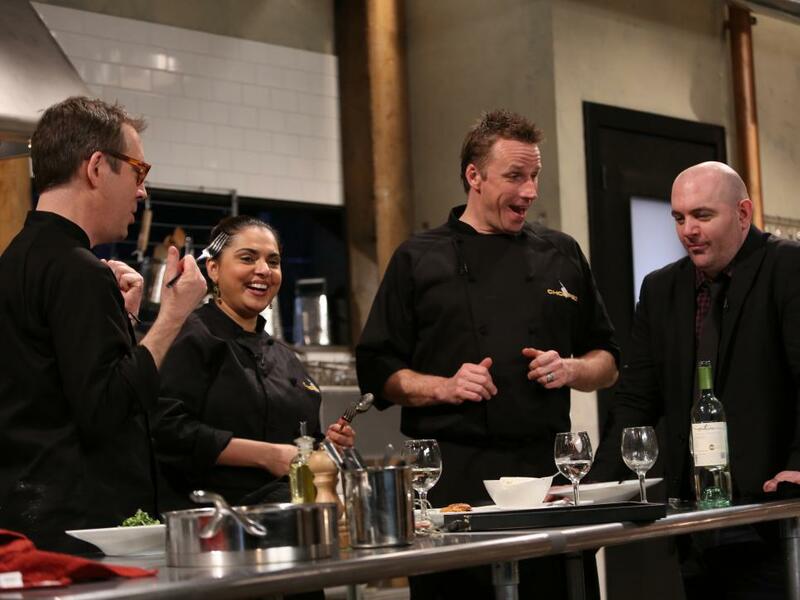 After they taste his dish, his peers agree on its stellar taste. 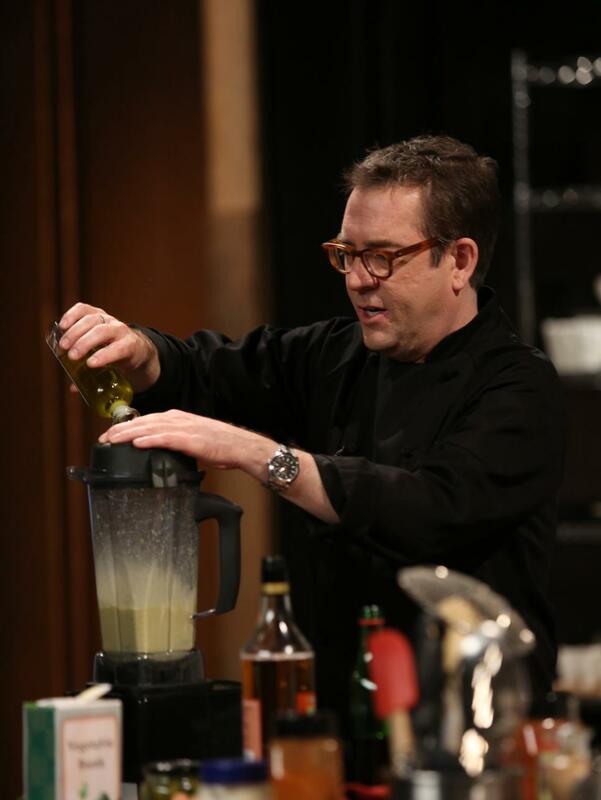 Much like what often happens to chef challengers, Ted faces a dilemma during the last moments of cooking, after his vermouth vinaigrette has broken in the blender. 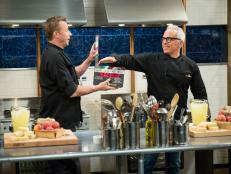 He ultimately decides to remake the dish, taking a few tips from guest host Chris. 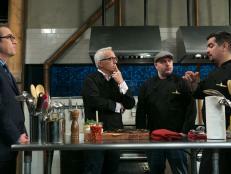 "Take it out, put a little Dijon mustard and an egg yolk in there, and then drizzle that back in," Chris advises Ted. The vinaigrette proves to be a shining element of Ted's offering, as Chris says, "It totally made the dish." 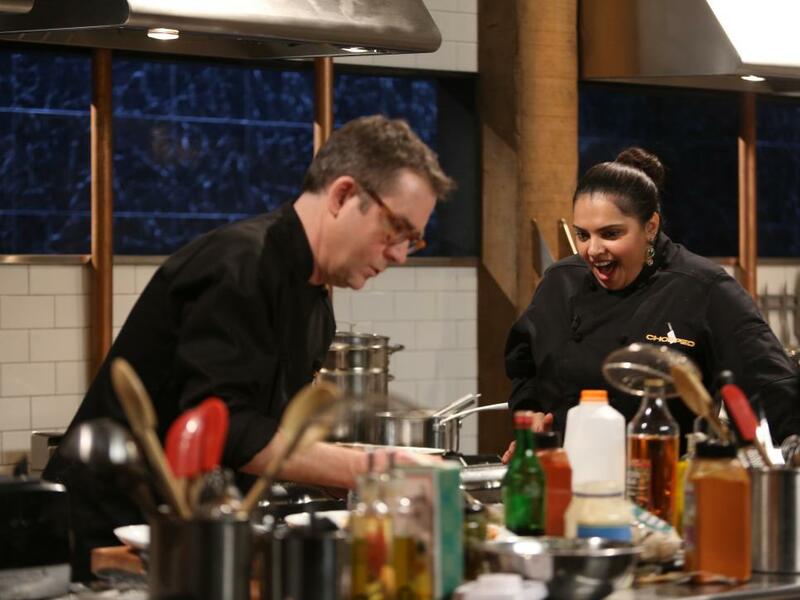 It's a race against the clock for Maneet, who, with just a few minutes left to cook, tells host Chris, "We'll see," about finishing her dish on time. 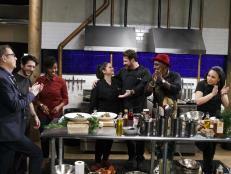 In the end, she manages to plate the pot pies within the allotted 30 minutes and serves the dishes to the guys. 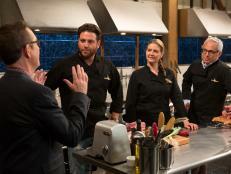 "This is really, really flavorful," Marc tells her. "And I can taste the crab — definitely a main course here." 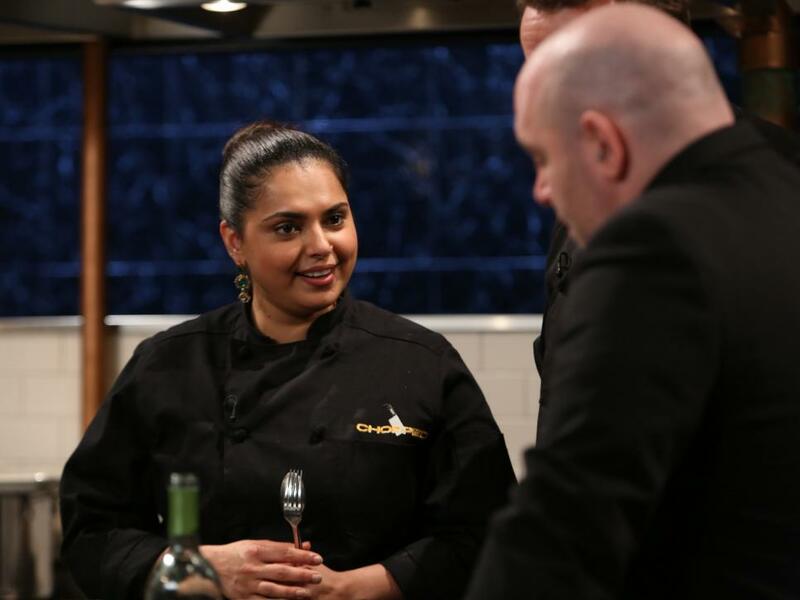 "I think the basket was amazing," Maneet reflects after cooking. 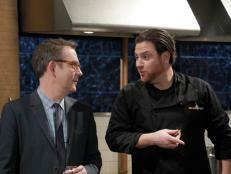 "We have, at times, seen some ingredients which are really, really difficult to deal with, but we nailed it over here." 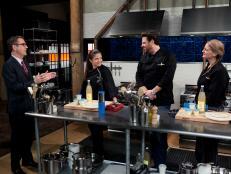 Raising their wineglasses, the chefs toast to another successful battle in the Chopped kitchen.